Death keeps finding a way to my backyard. Most recently, it was the bunny. The kids—my daughter and three neighbor friends—found him on the sidewalk after an encounter with a feral cat. He seemed hale and hearty except for the blood dripping from his engorged left eye. We fashioned a laundry basket and large sheet of cardboard into a low-tech trap and peacefully caught him. Then we—one mom, four kids, and one bloody bunny—headed to the local wildlife center for veterinary attention. Our good deed was done. Weeks later came the email from the wildlife center. The bunny died. Too much trauma, too much stress, too much damage; I don’t know the reason. I felt like our good Samaritan badges had been revoked. Would it have been better to leave him alone? Let him heal on his own? Would he have? Or would he have been a coyote meal? It had been a difficult month. A neighbor called one day reporting a sick opossum lurching through the yards. A police officer was dispatched to catch him but was unable (or just unwilling) to find the creature. He was dead in our yard the next day. Why do they always choose our yard to die? With a shovel, I gently removed him to a gully in the woods, the ground too frozen for a proper burial. I’d been struggling that week with another wildlife dilemma. One morning, when my dog and I set out for our daily constitutional, we came across a coyote. He didn’t move until we got within twenty feet—startling, because I didn’t notice him until he stood. How often are these creatures so close and we don’t even see them? On this day, he struggled to his feet and awkwardly loped off. He was so near I could clearly see the blood on his left rear thigh. He moved with a terrible limp. I felt guilty for having made him move. What does one do with an injured coyote? My laundry-basket-turned-rabbit-trap was clearly a bad idea in this instance. I consulted the experts: best to leave him alone unless he was seriously injured (broken leg or worse), in which case they would send professionals to trap him. I am in favor of medical care. My father was a doctor as is my sister. Doctors heal, doctors help. But trapping this wild creature when we weren’t certain he needed it? I wasn’t sure it was warranted. The neighbors and I decided to keep an eye out for him and see if he improved on his own. He didn’t. Or, he may have. We’ll never know. He disappeared a few days later. We watched him hobble for about four days, always on the edges of our yards, moving fair distances, and my kind-hearted neighbor religiously put out a delicious concoction of dog food and chicken soup every evening, which my own dog would have preferred to her sad bowl. (Feeding coyotes may actually lead to more problems.) Then, one day, he simply wasn’t there anymore. What happened? When people die we have funerals, memorial services, wakes. There are printed programs, flower arrangements, music carefully chosen. Friends, family, acquaintances, and colleagues come and pay their respects for the life that had been lived. Kind words are spoken about the lasting effect the person will have on the people or organizations they left behind. We reassure ourselves that the person’s life mattered. For all lives matter, surely. What about the bunny? The opossum? The coyote? Was their absence missed in the community of wildlife in our neighborhood? Did they leave their mark somehow? Was someone’s life improved because of them—maybe an offspring, maybe a mate? Or did they disappear without notice or fanfare? What is the measure of having lived a significant life in the animal world? In recent years, scientists observing a variety of animals—elephants, dolphins, chimpanzees—have documented behaviors that seem to indicate mourning. Personally, I believe this must be true, particularly in the more social species. Although I would prefer to indulge in the childlike magical thinking that maybe there was a ceremonial gathering of possums in my yard to offer a final dignified farewell, the lack of footprints in the snow shows there wasn’t. But I don’t discard the notion that some creature in my woods noticed the death and was somehow affected by it. My response to their deaths was in direct proportion to my own involvement. 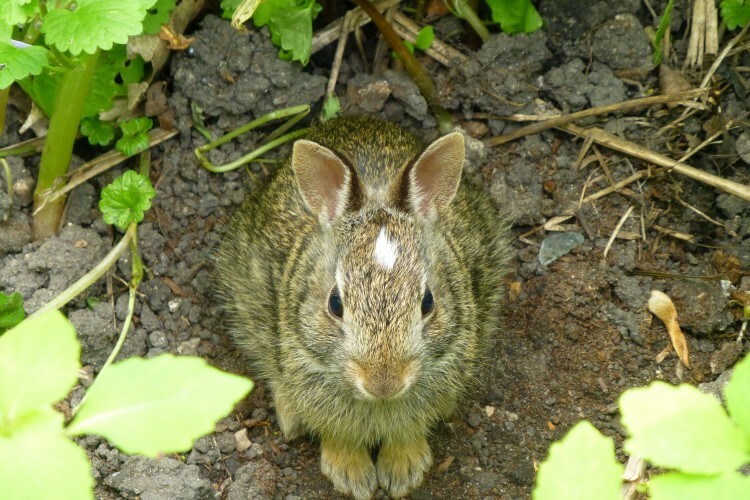 I was most saddened by the rabbit’s death, since I got involved and actively tried to save it. The opossum, not so much, as I knew he was ill and death seemed the kindest option. And the coyote? I hope against hope that he is still alive, that he is still gracing the edge of someone’s yard, that he is providing a moment of magic (or fear) for somebody walking their dog. But surely the meaning of their lives is more than that. More than just a brief moment of joy for the humans around them. They have a place in the food chain, I know, but my sentimental heart hopes for more. They can’t simply be food and the occasional flash of inspiration, for then, by extrapolation, I am led to the sad conclusion that perhaps that is all we are, fundamentally, as well. I had to explain to my daughter and the neighborhood children that the bunny died. Luckily, they are all middle school aged and know that death is part of nature. But on that cold winter afternoon, we were all cheering for that injured rabbit and I hate to think that little flicker of connection may have died with him. Honestly, I’m not sure what to tell them, except to live fully today. And tomorrow. And to hope for many more. Photo credits, top to bottom: makeshift trap with injured bunny (Michael Linardakis); coyote on the move (Gavin Van Horn); garden bunny (Gavin Van Horn).